Here's the bad news: Many of the items on the Cheesecake Factory menu are off limits if you're following a low-carb diet. Still, the large restaurant chain offers a number of low-carb options that will keep you full and happy, including two kinds of cheesecake that are lower in carbs than the regular versions. Be sure to check out the menu before you go, and track your meal on a calorie counter app, so that you have enough carbs available to enjoy your meal out. And don't be afraid to ask for substitutions or make modifications. For the most part, eating out at a restaurant like Cheesecake Factory usually isn't ideal for anyone counting calories or carbs or trying to lose weight. And the chain doesn't make it easy, as it doesn't readily offer nutritional information on its website. But there are ways to plan ahead and make sure you're making healthy choices, like using an online calorie tracker, no matter which meal of the day you consume here. 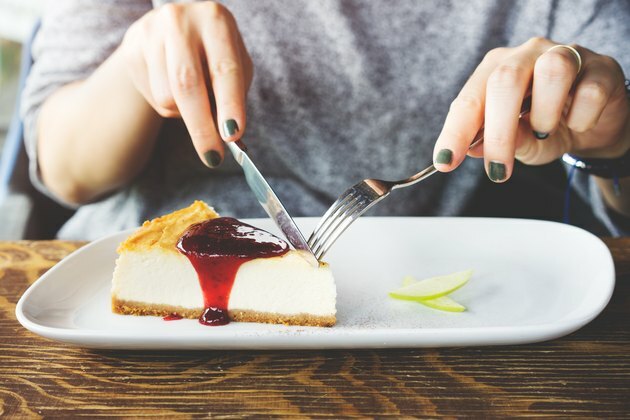 Nutritionists and dietitians alike recommend sticking to two specific sections of the Cheesecake Factory menu while watching your calorie or carb intake. The SkinnyLicious and "Super" Food sections offer slightly healthier fare than other parts and include lots of vegetables, whole grains and lean proteins. 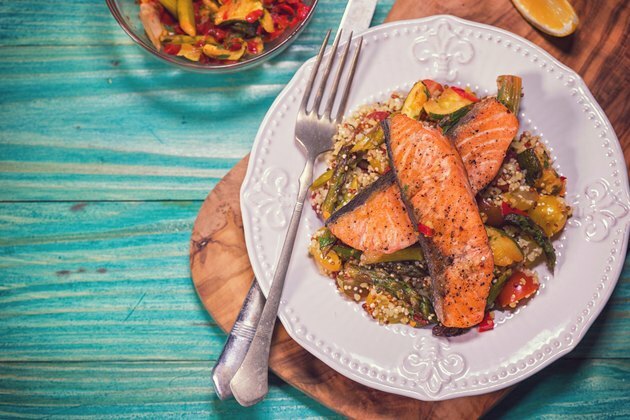 Alanna Cabrero, R.D., provided this tip to Women's Health when it comes to how dishes are cooked and then described on the menu: "Pros include roasted, steamed, fresh and sauteed. Cons include candied, crispy, melted and fried," she says. Plan ahead by taking a look at the menu before you go. Going in knowing what you'll order takes away the chance of being tempted by a higher-calorie dish when you're hungry and ready to order. Eat half of your dish of choice while dining at the restaurant, and save the other half for another day. If you order a salad, ask for the dressing on the side so you have control over how much you consume. Go bunless! If you're in the mood for a sandwich, ask for it without the bun or in a lettuce wrap instead. Skip the sides or replace fries with steamed vegetables or a side salad (again with dressing on the side). None of the entree-size salads has less than 20 grams of carbohydrates per serving. If you're eating a salad as your entree and you have more carbs to spare, you might go with the Caesar salad with or without chicken, herb-encrusted salmon salad, Cobb salad or the seared tuna tataki salad. Each of these salads has between 23 and 28 grams of carbs per serving. Note that salad dressings will add anywhere from one to five grams of carbs to your meal. The sandwiches and burgers on the Cheesecake Factory menu may not easily fit into your low-carb diet, but you can always ask for the patty without the bun. A traditional hamburger bun has 21 grams of carbohydrates, and it's likely the Cheesecake Factory buns are larger than a traditional bun. So if you go bunless you can expect to subtract at least 21 grams of carbohydrates from each of those choices above. And, of course, skipping the fries helps immensely too. Keep in mind that it's not always easy to know which dishes will fit your plan because carbohydrates can be hidden in the flavorful sauces smothering the poultry or meats. Dietitian Heather Mangieri, M.S., RD, CSSD, told Eat This, Not That! that her go-to meal at Cheesecake Factory is the Chicken and Mushroom Lettuce Wraps. "The calorie count is balanced, with around 27 grams of carbohydrate, 23 grams of protein and 16 grams of fat per plate," she said. "That, too, still leaves room to enjoy a glass of wine with my meal without overdoing it. However, the sodium content is pretty high (915 milligrams), so be sure to drink lots of water with your meal." Though the carb counts for the steak entrees are high for those trying to stick to a low-carb diet, remember that you don't need to eat the whole thing. You can save half for later. According to The Food Network, the grilled tuna is a great way to go. "Order the fish with a side of seasonal veggies, and share it with the whole table," the company recommends. The tuna itself without the veggies has just three grams of carbohydrates. Eggs aren't only for breakfast at Cheesecake Factory. The eggs and omelet section of the menu offers a number of low-carb choices throughout the day. Again, carb counts are high, so you might want to split with a friend (or two). Have you ever eaten at Cheesecake Factory? What did you think? What did you order? Were you trying to stick to a low-carb diet? Did you have any other dietary restrictions? Are there any tips you'd give to others? Share your thoughts and suggestions in the comments below! The free LIVESTRONG.COM MyPlate calorie tracker app for iPhone and Android has helped millions of people lose weight the healthy way — by getting support from an active community as they track their eating and exercise. Consistently a top-rated app, MyPlate offers the latest technology in an easy-to-use tool that includes millions of foods and recipes, five-minute in-app workouts and a robust support community.